Are you looking to become certified as a Relationship Coach? Embark on a journey that will lead you to meet and teach the most interesting people, and more often than not, people from whom you will learn. The point of the program is to equip men and women with concrete and abstract tools that, if embraced and used, will allow them to positively affect their relationship. Trust, gratitude, humility, and accountability are the cornerstones of any lifelong relationship. The tools and skills you will teach your clients are designed to lead them to incorporating those cornerstones into their relationship. In the 24 years I have been coaching couples and individuals, it has been an honor to witness many transformations in marriages and relationships, from couples who have filed for divorce and at some point in the coaching process canceled the proceedings, to couples who haven’t been physically intimate in 5 years, but through coaching began to connect again, emotionally, spiritually, and physically. I wish you enjoyment and success as you consider taking on the privilege of being the vehicle that imparts life-changing information to hundreds and thousands of people ready to make their relationship the best it can be! Included in the cost of certification is the coaching manual, which is divided into 12 sections, one for each week of the 12-week program. Each section gives you step-by-step instructions on how to work with a couple or individual. Each week’s material and assignments build upon the last week’s material and assignments, helping the client to solidify all of the tools, skills, and concepts he or she is learning. At the end of the manual is a section devoted to the operations of a relationship coaching practice, as well as the marketing and promotion of the practice. The final section of the coaching manual is devoted to creating a “Romance Workshop” for your clients, something I have done for 22 consecutive years. Included in the cost of certification is your ability to have me coach you to become a relationship coach. Together we will work through the coaching manual for 6 consecutive one-hour weekly sessions, after which you will receive one-hour monthly coaching support from me. I am available in between our formal sessions to answer any questions you might have. Kathy teaches you her program “From the Heart.” She not only provides her step by step material, she also offers her support and encouragement for YOUR success! As a Certified Relationship Coach graduate of the Kathy Dawson Institute, I offer my sincerest appreciation and gratitude to a truly gifted and inspiring women, Coach Kathy Dawson! To learn more about Kathleen Krupar and her relationship coaching practice, visit: www.couplescommunicating.com. 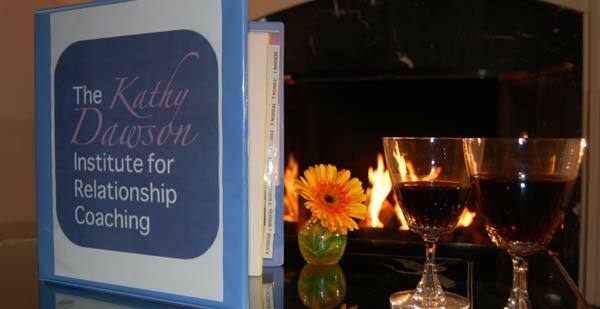 Training to be a relationship coach with the Kathy Dawson Relationship Coaching Institute has been a great ride! And, it has put me on the path to doing what I love. When Kathy works with couples she can see the potential available for them and knows how to guide them toward it. Through fun and creative exercises and processes they learn to reconnect, building their relationships to be stronger than ever. This is the skill that Kathy has passed along to me through her training. Kathy’s program is clear and detailed, her enthusiasm and passion for the work inspiring. I really appreciate how available Kathy has been and continues to be when I have questions or want clarifications. Especially helpful to me are the stories Kathy has to share from her years of experience working with couples. And, I am so thankful for her encouragement throughout the process, especially when I was first getting started. If you want to work in an inspiring field where you know you make a difference, consider training with Kathy at the Kathy Dawson Relationship Coaching Institute. Imparting new information, tools, and skills to people who are hungry for them. Watching men and women embrace the tools you’ve given them and change their lives in amazing ways. Knowing with assuredness that you have made a positive impact on others’ lives. Teaching such life-changing material, and thereby changing your life for the better, as well.